Can I view images for a specific tag? Why does my slideshow continue after I've paused or stopped playback? Can I replace my video with a slideshow? What zoom effect is used and why do my pictures sometimes shake and wobble? Can I turn the zoom effect off? Slideshows are a great way to add visual elements to your recordings without using video. This tutorial will show you how to add images to your Picture Gallery and create wonderful slideshows that can be used on any recording. First you'll need to navigate to your Picture Gallery. To do that click on your username in the top navigation bar and then click on Picture Gallery. To add a new picture click on the "Add a New Picture to Your Gallery" button. Fill in the following information and click the Add Picture button. Title: The title you'd like to show for the picture. Tags: Use tags to create groupings within your gallery that can be used as slideshows. For example you could have a "sunset" tag that is used for sunset pictures. If you don't wish to add a tag leave the tag box blank. If you would like to add more than one tag separate the tags with a comma. Sharing: Choose how the picture will be shared in your Gallery. Public: Anyone can view the image in your Gallery and the image can be used in a slideshow. Private: Only you can view the image in your Gallery and the image cannot be used in a slideshow. Slideshow Only: Only you can view the image in your Gallery and it can be used in a slideshow. * We don't have a direct upload option for images, so they would need to be hosted elsewhere. Popular choices are PhotoBucket, imgur and Flickr. Once you've uploaded the graphic to one of these sites they will provide you with the URL for it. How to get the URL varies from site to site but on PhotoBucket for example they call it "Direct link" and display it in the right column when you view a graphic (you can tell that it's a graphic URL since it starts with "http" and ends with ".jpg", ".gif" or ".png"). 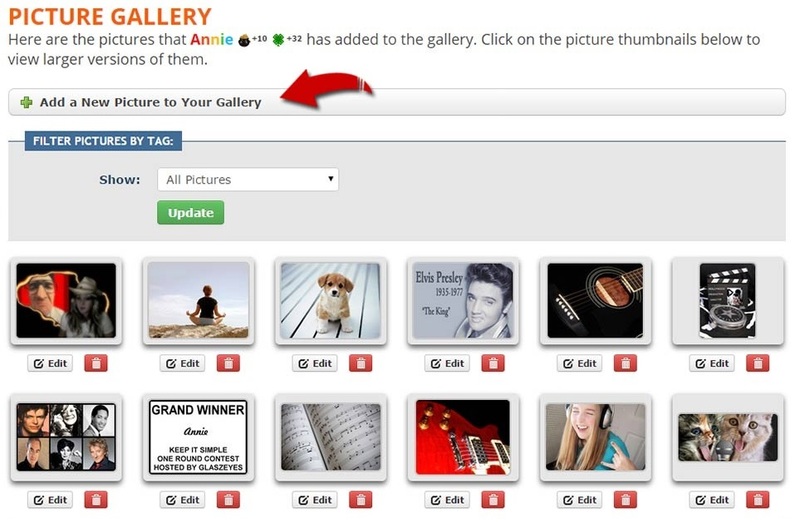 Once you've added pictures to your Gallery they're ready to be used in slideshows. You can add slideshows to any of your audio only recordings. Slideshows can be added during the initial mixing or remixing of a recording or by editing a recording. When mixing or remixing an audio only recording click on the "Slideshow" button to add a slideshow. ** If you want to select specific tags to be used in the slideshow click on the "Select Photos" button to expand a list of tags. If no tags are selected all gallery images will be included in the slideshow. ** Slideshows can only be added to audio only recordings. However, during the 7 day remix period any video recording can be remixed and the "Remove Camera" button can be clicked to remove the video allowing a slideshow to be added. After the 7 day remix window has passed slideshows cannot be added to video recordings. If you chose to select specific tags select the tags you'd like to include and then click on the "Done, Go Back to the Mixer" button. Finish mixing and saving like normal and your slideshow will be added. When editing an audio only recording click on the Slideshow setting and select the options you'd like. Off: No slideshow is added. On: All public gallery pictures used in slideshow. Tagged: Only pictures from the chosen tag(s) will be used in slideshow. Choosing Tags: Choose one or more tags to be used in your slideshow. 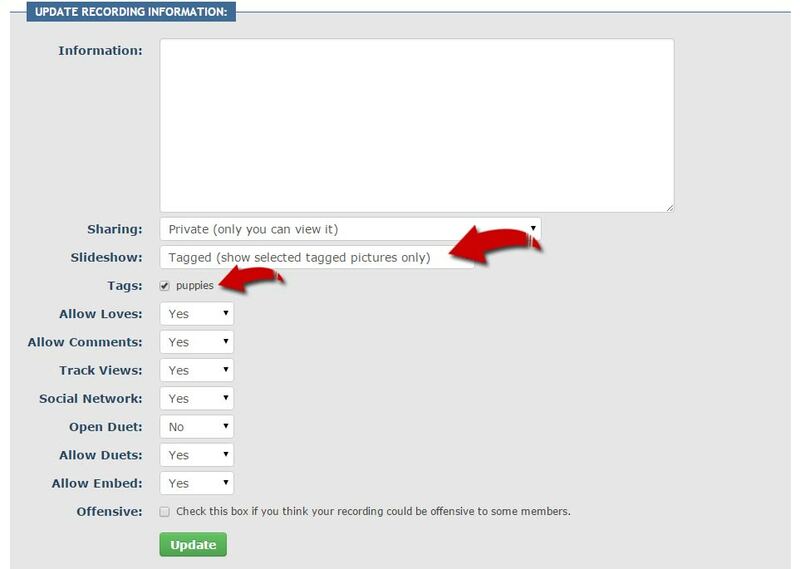 Yes, you can choose to filter by tag from the main Picture Gallery page. Click on your username in the top bar menu, click on Picture Gallery, choose a filter option from the drop down menu and click Update. Why does my slideshow continue after I've paused playback? The slideshow is added as an overlay on top of the player. When you start playback the slideshow will start. Once started the slideshow will continue to play until you click Stop. This is normal and expected behavior. Yes and no. You can't replace a video with a slideshow, but you can remove the video and then add a slideshow. If your recording can still be remixed (available for 7 days after recording) you can remix and click the "Remove Camera" button to remove the video allowing a slideshow to be added. After the 7 day remix window has passed slideshows cannot be added to video recordings. Slideshows use the Ken Burns Effect. Sometimes this panning and zooming effect can cause the image to wobble or ripple. Very large images are prone to this. Resizing the image may help reduce the wobble/ripple. Yes, you can disable the zoom effect by using images with a 4:3 aspect ratio (320 x 240, 640 x 480, 800 x 600, 1024 x 768, etc.). The zoom effect is dependent on the aspect ratio of each image. In other words, if you wish to disable the zoom effect for an entire slideshow all images must have a 4:3 aspect ratio.